How to deal with rejections & failures with ease? Have you experienced rejection at work? We are glad you’ve clicked this Skillopedia video. You can experience rejection for many reasons. They all have one thing in common. Being rejected is painful, but, many instances of rejection are opportunities for learning. Actual rejection and feelings of rejection occur in a variety of work-related situations. Rejection can hit you unexpectedly and could put you down in the dumps. 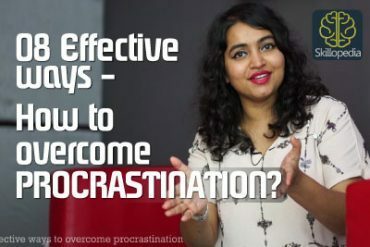 In this video, Niharika explains easy steps to deal wit rejection and overcome the fear of rejection. You didn’t get a promotion you were wanting for very long.. so what do you do?? Go run to your boss and fight on top of your lungs, Sure, you feel bad. But, you won’t receive reasonable feedback from a co-worker or boss if you cry through the meeting. If you are angry and you display your anger in the conversation, you will experience the same. If you argue, deny, blame, or attack the person giving you feedback, the feedback you receive will be so sanitised that it is rarely actionable or relevant. Worst of all, Your boss or co-workers will feel manipulated by your emotions; this is never a positive factor for your performance improvement, prospects within your company, or opportunities after an initial rejection. Avoid getting on social media to air your grievances. The internet never forgets and when you’re trying to get that fab new job, your employer might check the internet and see that you don’t handle rejection well. No matter how upset or angry you are, just don’t. Don’t complain too much. Don’t start in about your rejection every time you’re talking with your friend. If you think you’ve gone overboard, make sure to ask them “Am I dwelling on this rejection too much?” If they say yes, please adjust accordingly. Fail fast and get over it. Remember that rejection is something that happens to everyone–even the most successful people. Mentally strong people know that rejection serves as proof that they’re living life to the fullest. They don’t make sweeping generalisations when they’re rejected. No one is perfect and that’s the beauty of it. Keep things in perspective and remember that you’re much more than a project–or even a career. Take positive action to develop or change the areas about which you received feedback. Rejection is generally not about one person; it often impacts an entire team. In situations where a major client leaves an agency or an important pitch is rejected, the team looks to their leadership. Show your team how to handle rejection gracefully and move on. Mentally strong people ask themselves, “What did I gain from this?” so they can learn from rejection. Rather than simply tolerate the pain, they turn it into an opportunity for self-growth. With each rejection, they grow stronger and become better. Any kind of rejection, no matter if it’s in love, your career, friends, a proposal or anything else, it should not be something that should affect your happiness So hope u enjoyed this session and gained some useful insights on how to handle rejections with ease. Next Next post: 7 Quick & Easy ways to learn English faster.